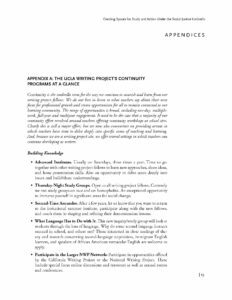 Continuity is the umbrella term for the way we continue to nourish and learn from our writing project fellows. We do our best to listen to what teachers say about their next focus for professional growth and create opportunities for all to remain connected to our learning community. The range of opportunities is broad, including one-day, multiple-week, full-year and multiyear engagement. It used to be the case that a majority of our continuity effort revolved around teachers offering continuity workshops at school sites. Clearly this is still a major effort, but we now also concentrate on providing arenas in which teachers have time to delve deeply into specific issues of teaching and learning. And, because we are a writing project site, we offer several settings in which teachers can continue developing as writers.